The KitchenAid mixer starts at a standstill as you add your ingredients to the bowl. 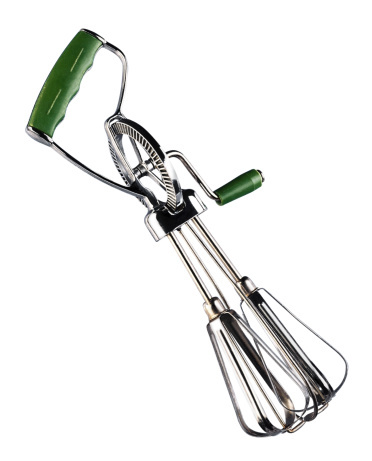 When you are ready to use the mixer, you have to work your way up to higher speeds, based on what's in the bowl. However, if you try to hit higher speeds from the get-go, the mixer can run out of control and even cease to work. From the "Classic" to the "Commercial" models, KitchenAid has programmed its mixers to best start at slower speeds. However, if you are already properly exercising this initial step, you might need to look more in depth at additional aspects of mixing. The KitchenAid mixer can struggle with dough, much like using manual methods. Move the "Speed Control" lever to the lowest setting on "Classic" models, when starting the mixer. Gradually, move the lever to higher speeds to avoid splashing. In more robust heavy-duty models, such as the "Commercial" mixer family, KitchenAid actually includes a feature that encourages starting at slower speeds, called "Soft Start." Pull the lever to this setting before starting the mixer. Slide the "Speed Control" lever to the off position if the mixer stops operating due to being overloaded, dependent on the model. Wait about five minutes while the mixer automatically resets and then re-select a speed to restart the mixer. This feature is called "Auto-Reset Motor Protection" and it detects an overload and allows the motor to rest. Refer to the "Tips," "Recipe" or "Ingredients" section of the owner's manual that came in the original packaging with the mixer. Match your recipe and ingredients with the recommendations presented in the manual, to make sure you are using the mixer correctly. For example, if you are mixing ingredients that are more liquid than solid, you should start on a low level to avoid splashing. However, you can increase the speed, after the liquid gains a thicker consistency. This speed control relies on your personal judgment, instead of just arbitrarily choosing one setting. Turn to the section of the owner's manual that concerns "Speed Control" or "Settings." Some KitchenAid mixers have the "Stir" setting, which is the slowest setting. If you are kneading dough, for example, you might be tempted to use the higher speeds to ensure a thorough job of mixing the dough. However, the company recommends that you keep the setting at number "2" for "Slow Mixing," though the unit can reach as high at number "10" for "Fast Whipping." Selecting a higher speed can damage the mixer. How Does a Kitchen Mixer Work?